In our previous article we discussed the 4 stages of team development, and learned the stages team members go through to reach their peak performance. The first stage happens when the team is formed, and work begins on a project. At this point, the most important question for team members to ask is how they can work together. This includes roles,responsibilities, rules, methods, tools, and everyday routines. One of the most important routines team members conduct on their journey together is having meetings. Now, you know the feeling of arriving to your desk, ready to get some work done – when all of the sudden you get a call for a meeting? Yeah, it can feel like somebody came and took the chair from beneath you. Then, you find yourself stuck in a two hour meeting, listening to a team leader talking about things that must happen, but will never actually end up happening. Eventually, you and your colleagues will never get those hours back in your lives. Let’s face it, meetings are often considered a necessary evil. Like taxes, they are inevitable. Many teams consider meetings as empty rituals to be agonized over before “actual work”. However, when people work together, they will need to communicate regularly for great things to happen. Team meetings are essential, and need to bring value. Members must also engage with each other to handle the hard work ahead. Now, what are the essential meetings teams must have? An efficient daily meeting is the best way to frame up the day and outline the tasks at hand. Team members can gather to quickly go through the day’s tasks and expectations. Potential blockers can be brought to the forefront, and addressed in a timely manner. These meetings are most productive when tackled first thing in the morning, at the same place, during the same time. Consistency helps team members form a sense of ownership and camaraderie. Have your team members stand in a common area. This will help keep team meetings short and efficient (about 15 minutes is your sweet spot). Why standing? Standing boosts your mental readiness, and if meetings become stagnant…the slight discomfort of standing for an extended period of time can set in. Keeping the meeting short helps your team stay on point and focused. It’s much harder for minds to wander! TIP: Do your daily stand-ups while drinking your morning coffee. If the coffee is still hot at the end – your meeting was a success. What are the important topics to address in a daily stand-up? Every team member needs to engage. It can help to have a system for each team member to address the group. Start with the last arrival (encouraging punctuality), then move clockwise. Three questions should be answered. TIP: To be more efficient, everybody should be prepared by knowing in advance what was accomplished yesterday (team members will keep this visible for everyone using a project management tool or Kanban board). These questions should focus on accomplishments rather than activity. People have a tendency to stay focused on what they are doing without considering whether these activities are making progress, or bringing value. Encourage your team to focus on work items that actually “move the needle”. Take note, this is not a reporting meeting. Team members should not feel as if they are giving reports to a manager. Neither is it a time for complex problems to be solved, because that requires thorough discussion and debate, and may not involve all team members. The morning stand-up serves to bring issues to the surface, and keep everyone in the loop. Following a plan is critical for team members to know their objectives and deliverables. At times, an ever growing and dynamic environment requires changing an initial plan. This does not mean changes exclude having plans altogether, rather it requires team members to be flexible (agile) in order to respond to change. As the workflow progresses, team members will need to be aware of relevant business changes, and adjust the course as necessary. This is why weekly review and planning meetings are crucial. Team members can reflect on the week’s accomplishments, solve any blockers/issues, and decide what needs to be changed or improved. More importantly, they can plan and agree on what goals need to be accomplished in the next week. Start by bringing your team together, every Friday for a 30 minute meeting. Each team member should come prepared to share their top priority for the upcoming week. And most importantly: focus on completed objectives. This means the team should be able to arrive to the meeting with a synthesis of their individual week’s efforts. At this time, feedback will become relevant if work has taken shape – even if it’s just a fragment. This weekly review meeting is all about managing effectively – sharing information about progress, making informed decisions and planning future steps based on discovery. This is a chance for your team to review important milestones. As they learn more about the customers and market, they may shift strategies and develop new milestones. Ask questions like: Are these tactics still relevant to our goals? Do we need to change priorities? Is there any new learning that will require us to change what we are doing? Week review – How are we standing after this week? What our customers are saying? Focus on the most important things of the week, and make sure everybody understands why those are the priorities. Talk about numbers, they can tell a lot. Collect feedback and resolve issues. Plan for the next week – Make sure the team doesn’t leave without clear action steps for the next week. In fact, action steps should be the only output of the meeting. 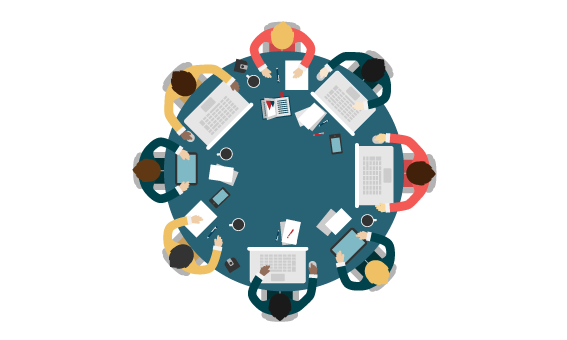 Closing round – If your team wants continuous improvement, you will have to leave room for improving your weekly meetings as well. Set a few minutes aside to ask team members: What did we do in this meeting that really worked well? What happened that we never want to repeat? Are there bad habits that we seem to keep falling into? Follow up – Make sure everybody leaves with the essential information from the meeting to move forward. The best thing is to keep information visible for everyone on a project collaboration tool. To be able to continuously improve, team members will need to adopt the practice of reflecting on their way of working. This will help your team make better progress and get results more efficiently. The best time and place is with a monthly retrospective meeting. Have your team get together the first Monday of the month and let them decide what can be learned from the previous month and what can be changed or improved. A common format for analysis is to “stop, start, and continue”. What actions can we take to improve our process? The focus of this meeting is not about what happened yesterday, it’s about tomorrow. Gather lessons learned, make agreements, and outline action steps applicable for right now. Discuss results by comparing work planned with what the team completed. Talk about the team roles and responsibilities and how well aligned they are with the team’s objectives. Are teammates communicating and collaborating well enough? What about tools and processes? How well those are supporting workflow? Can we change the tools and processes to make them work for us? Finally, how can the team improve productivity and get the most out of their work? As an employee, how do you get feedback from your manager on an exciting idea you’re not sure is relevant, without looking naive? How do you bring up a team member who is blocking your progress, without setting them on fire? How do you get help if personal life issues bug you in your work? So, what team members should do with those brilliant ideas, pressing issues and constant frustrations that don’t find place in status reports, emails nor in joint team meetings? One-on-one meetings can be essential for these areas of discussion. This is a place for team leaders to devote themselves to their team members. Having consistent, effective communication between the team leader and team member builds essential trust. When team leaders learn more about the individuals in their team, they can better support them, show they care, and make the company a great place to work. Of course, the key is to be sincerely interested in people. As a team leader, you must be personally invested with each and every person on your team. Because if you don’t care, they won’t either. Effective listening means resisting the urge to interrupt and developing the ability to ask discerning questions. Do 20% of the talking and 80% of the listening. How can we improve in any way? What is bugging you in your work? How would you describe the perfect teamwork? If you were me, what would you do better? If you could change one thing, what would that be?Why? One-on-one meetings help team members self-reflect, and help team leaders uncover strengths and interests previously unexpressed. From a strategic perspective, this is critical to make better plans for bringing the best out of individual team members. So, tell us about the meetings you are having with your team? How lucky you are with keeping those meetings short and useful? Join us next time when we are going to discuss the ways of making meetings more effective.